My mother’s mother, Mildred Davidson, grew up in Oklahoma. She married a local boy at sixteen. Over the next couple of decades, she gave birth to eleven babies. My mother, Leona June, was her fourth child, the second to be born in California. My maternal grandparents could have stepped out of John Steinbeck’s “Grapes of Wrath.” During the depression, in 1933, they migrated from Oklahoma to California to find work. They toiled long days picking cotton in Bakersfield. When my mother was born, a cradle was an unimaginable luxury. She was tucked into a fruit crate, while my grandmother kept on working. Her next two babies died. This is not a rags to riches story. My mother, and her eight siblings, grew up in a four room shack. My grandmother made their clothes, grew fruit and vegetables, raised rabbits and chickens, cooked endless meals, washed mountains of laundry, and labored in the fields, until ovarian cancer snuffed out her life at the age of 45. My nineteen year old mother, newly married, with a baby of her own, was left four little sisters, a brother, and a pair of well-used cast iron skillets. She fried chicken and made corn bread in the pans, until my dad bought her a modern electric skillet. I still use my grandmother’s cast iron skillet for frying chicken and baking cornbread. I also use it for omelets, casseroles, chili, and cakes. It’s one of my most prized possessions. Every time I heft the big, black, iron rich pan onto the stove, I’m filled with gratitude for the women who made my life possible. I never had the privilege of knowing my grandmother, save through my mother's tales and this one practical legacy. Whenever I am especially missing my mama (which is more often than I care to confess) I make fried chicken in my grandmother’s cast iron skillet. Within the hour, I am soothed and comforted. I close my eyes and imagine I am sitting at the table with my mother and grandmother, listening to their stories, looking into their beautiful, animated faces. Home. 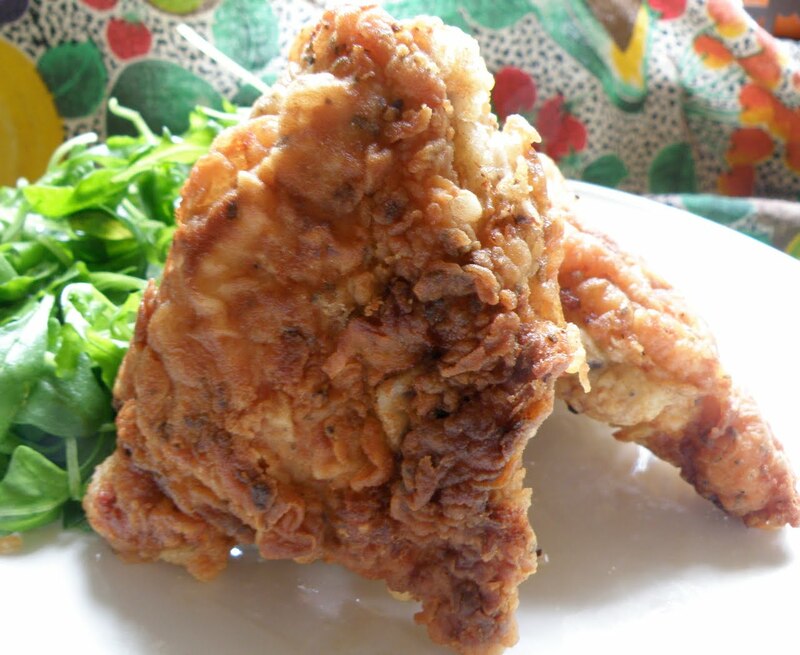 When we get together, homemade fried chicken is our family’s favourite meal. It’s my mother's specialty. Later, it became my dad’s too, along with a fine roast turkey. I am partial to legs and wings, but all chicken tastes superb cooked like this. 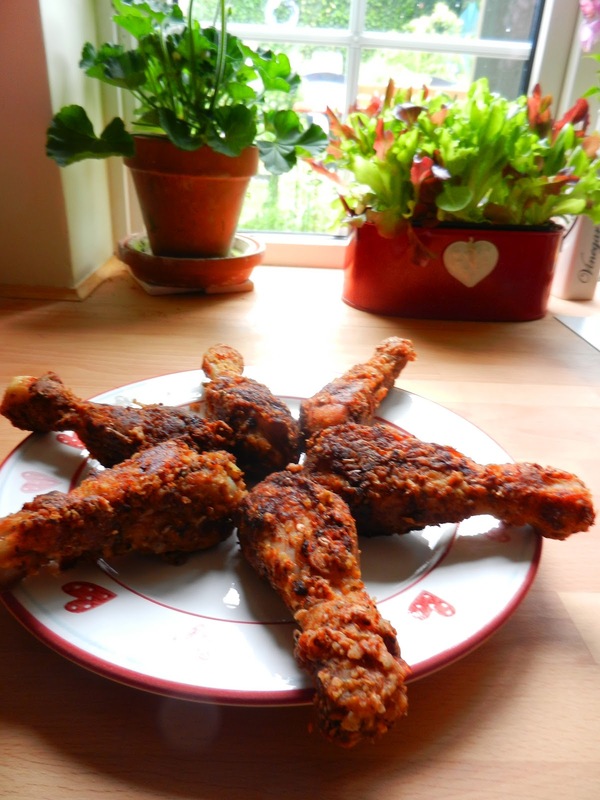 My parents and I agree, fried chicken is more flavoursome on the bone, but use breast fillets if you prefer. Chicken: 12 - 16 pieces of your choice. Allow at least two pieces for each person. Three wouldn’t be overly generous. I buy Waitrose's Organic Malted Grain Flour made with malted wheat flakes, which adds an appealing texture to the chicken. If you can't find malted flour with flakes, try other textured flours, or combine toasted bread crumbs with white flour, mixing 30% breadcrumbs to 70% flour. Skin the chicken pieces (except for wings) It makes a big difference. The coating will stick much better with the skin removed. 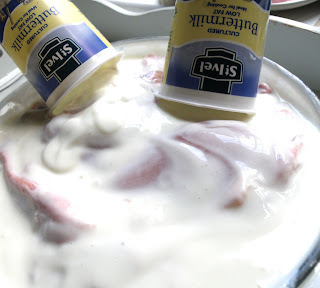 If you need to get a better grip, while pulling it off, especially the legs, use a linen towel for traction.Place skinned chicken in large bowl, cover with buttermilk. Turn and thoroughly and coat all the pieces. Refrigerate, covered for at least couple of hours. Overnight is better. This tenderizes the chicken like nothing else. Before preparing to cook, allow chicken to sit on counter a half hour or so. You want to get the chill off before cooking. In a large bowl, combine flour, salt, pepper, cayenne, and garlic power. Mix well. Heat half the oil (about 1/2 cup) in large skillet, over medium heat. Reserve the rest to use as needed. Thoroughly coat chicken in flour mixture. Make sure each piece is completely blanketed in seasoned flour. Place chicken in hot skillet, one piece at a time. Even with a large skillet, you will need to cook the chicken in a couple of batches. Leave plenty of room for turning chicken easily. While chicken is frying, prepare a large platter lined with paper towels, or a clean kitchen towel. Fry chicken about eight minutes on each side, or until crispy and well-browned. Don't turn it too early, or it won't crisp properly. Patience is always rewarded in the kitchen. As it cooks, turn meat so that it is browned at every possible angle. Wings especially need to be positioned for maximum crisping. As the oil is absorbed, add extra as required. When chicken is crispy golden brown all over, remove to towel lined platter. If you are making a lot of chicken, and want to keep it warm, transfer from skillet to oven tray on low heat. 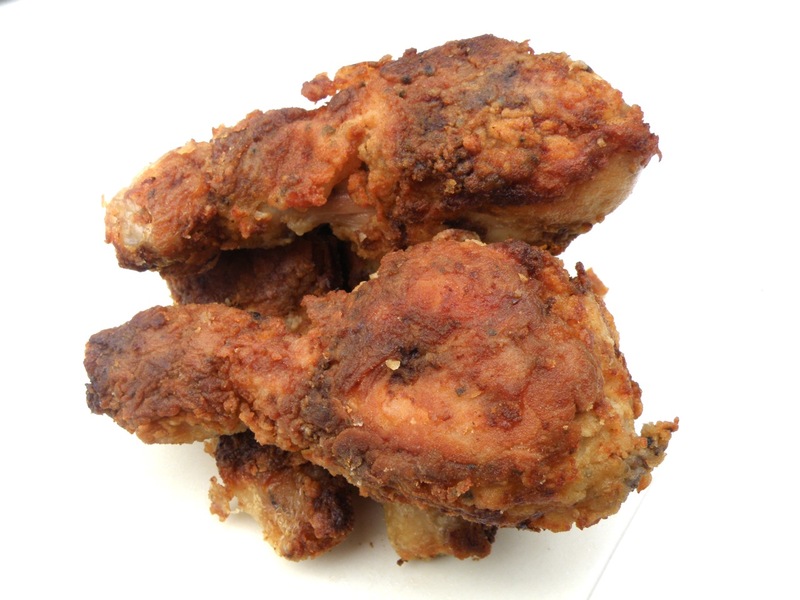 If you are making chicken for the next day, allow to cool completely before covering and storing in the fridge. Be sure to make a few extra pieces for the cook. I can never resist chicken hot, cold, or anywhere in between. My favourite accompaniments for hot fried chicken are mashed potatoes (made with buttermilk and butter, please) and dark, steamed greens, dressed in a bit of lemon juice. Baked yams, instead of mashed potatoes, are also excellent. Other side dishes to consider are corn bread, corn-on-the-cob, asparagus, and French beans. The ideal dessert is peach cobbler, made deep dish style, topped with vanilla ice-cream. Cold fried chicken is best with potato salad, coleslaw and deviled eggs. During picnic season, watermelon, blackberries, chocolate chip cookies, or ice cream sundaes are the perfect finish. Recommended Drinks: Chardonnay, Pimms (original) rose scented lemonade, sparkling water, hibiscus juice, iced tea (black, oolong, or green) and homemade fruit punch. Little, glass bottles of ice cold Coke are a fun beverage with retro 50's style of food. Country music always goes with fried chicken. 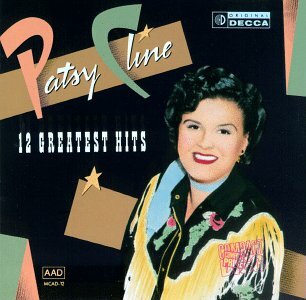 For some reason, Patsy Cline easily comes to mind whenever I'm slaving over a hot stove. Her kind of music was made for this kind of food. 1920's style French Cajun music is fun too. Give a listen to Ann Savoy's "Getting Some Fun Out of Life." You'll be jigging with your sweetie into the wee, small hours. Many meals are made all the better when cooked in traditional cast iron. Not only do I think fried chicken tastes best cooked this way, so too does chili, casserole, stews, meat and fish pies. If you have never cooked with cast iron, permit me a suggestion. Take a look at the Lodge Cast Iron. Impressive quality and selection. Sold in the US and UK. 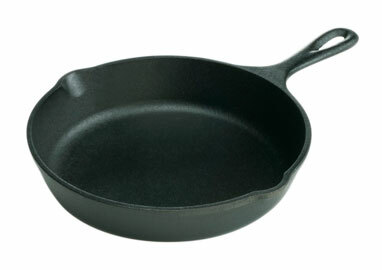 With proper care, quality cast iron (not to be confused with budget cast iron) lasts generations. Granted, they are heavy pans, but besides helping maintain upper body strength, they also add important iron to your meals. Try a piece of quality cast iron cookware and see what you think. This is not a paid advertisement, but it probably should be. Mama's Fried Chicken brought to you by the good folks at Lodge Cast Iron. 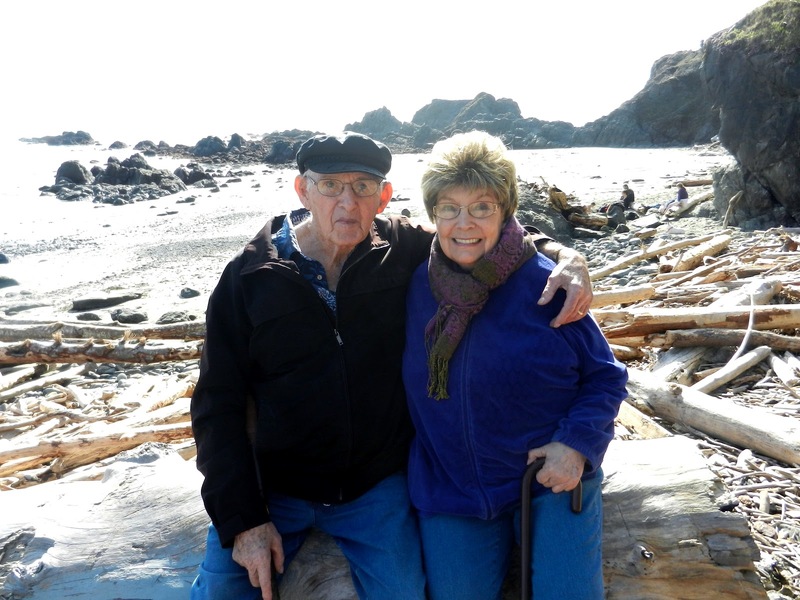 Mildred's daughter, Leona June, has been married to my daddy, Harold, for 60 years. They stopped having babies after two daughters. 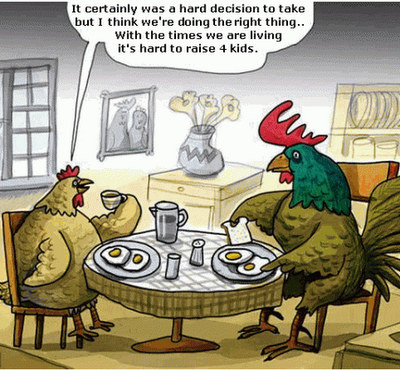 They stopped having grandchildren after two granddaughters. And they stopped having great-grandchildren after one great-grandson. They live by the sea in Oregon, USA, where they can often be found picnicking on fried chicken.